The living quaters of the deity Taishaku-Ten 帝釈天 in the Buddhist paradise Tooriten 忉利天 Toriten. It is decorated with a lot of cloisonnee or situated in a sea of cloisonnee and has a great garden for the gods to enjoy. This is another expression for a mirage, shinkiroo 蜃気楼. Joyful to See 善見城 (Kikenjo) in the Trayastrimsha Heaven on the peak of Mt. Sumeru. He is also known as a god of wealth in Japan. Taishakuten is often depicted riding an elephant. is nr. 57 of the 60 signs of the Chinese zodiac. 猿田彦神社 is famous for its First Koshin Festival. Faith in the deity Taishakuten initially centralized in Edo, later it expanded, when it began to be associated with the practice of Koshin-machi, waiting for Koshin , fueling popularity in the festival "Yoi-goshin 宵庚申" (Eve of the Koshin Day) during the late Edo period. There are also some Taoist elements mixed in this celebration. The Temple for Taishakuten in Shibamata 柴又帝釈天, Tokyo became famous through the movie series of Tora-San, Otoko wa tsurai yo. 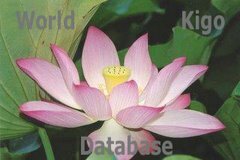 For details about Kooshin 庚申 Koshin, see below. These three days are somewhere during the end of july, beginning of august, in the hottest time of the year. The Characters 三伏の猛暑 are used when writing a letter of sympathy to someone on these days. This is a Chinese custom, making them on the 5th day of the 5th month or the 6th day of the 6th month or the "sanpuku days". Ceremony on the day of Koshin sama (ka no e saru). It comes in the middle of November, 60 days after the one before. Very seldom this day falls in December. Rituals are held in all the Koshin halls. The wayside gods (doososhin) are also celebrated on this day. On the night before, people get together and celebrate with ricewine. The streets in front of the Taishaku temples are especially lively on this night before. "Waiting for the Moon," and "Waiting for the Sun." "Waiting for the moon" is an occasion when people gather on particular evenings of a lunar cycle (e.g. the seventeenth, nineteenth, twenty second, and twenty third) to eat, drink, and pay homage to the moon as they wait for it to appear. The gatherings are often organized by religious organizations known as kō, whose members assemble at their established meeting place (tōya, usually the organizer's home), hang a scroll of the moon god, Tsukuyomi no Mikoto, in the tokonoma alcove, light (a) votive candle(s), and wait for the moon to appear. The idea of installing Tsukuyomi no Mikoto as an object of worship (saijin) is a product of the modern era and reflects the influence of Edo Period Shintō scholars; originally, the moon itself was worshipped as the avatar of the kami (shintai). The designation for moon-waiting groups accords with the day of the cycle on which they assemble; examples include: the jūshichiya-kō (Confraternity of the seventeenth night), jūkuya-kō (Confraternity of the nineteenth night), the nijūniya-kō (Confraternity of the twenty second night), and the nijūsan'ya-kō (Confraternity of the twenty third night). The last of these is the most widespread and is also called san'ya-machi (third night waiting), san'ya-sama (honored third night), and sanya-kuyō (third-night memorial service). A tower erected for the twenty-third night gathering can often be found in a remote corner of many villages and hamlets. Moon-waiting confraternities that meet every month are rare; they are usually held only in the months of January, May, September, and November. Ki-no-e-ne (a special day in the sexagenary, on which the day of the rat and the element wood fall together), and Mi (day of the snake). They hold an all-night vigil and then worship the dawn. Because at both moon-waiting and sun-waiting events participants are required to make ablutions, to take baths, and to don clean clothes, scholars believe that such events were originally rituals of abstinence and spiritual purification (shōjin-kessai).
. Monkey amulets from Shibamata Taishaku Ten .
. byakudan 白檀 sandalwood (chandan) .
. ibokami 疣神 Deity taking away warts . In this region it is customary to visit the Taishaku temple at least once in your life, otherwise there would not be a smooth passing to the Buddhist paradise.
. Onibashi 鬼橋 the Demon Bridge . This is sometimes found in temples of the Nichiren sect. It refers to the Daimoku of Nichiren, sometimes to other deities. One of the most famous is Taishaku Ten in Shibamata. This temple, formally called Kyoei-zan Daikyoji, was founded during the Kan-ei Period（1629） under the auspices of the nineteenth head priest of Hokekyoji Temple in Shimofusa Nakayama, Reverend Zen-nai-in Nitchu. The second head priest of Daikyoji, Rev. Daikyo-in Nichi-ei, is credited for its actual logistical establishment. For many years, this temple housed a figure of Taishakuten (Indira), until it disappeared for a period during the middle ages (between the later Heian and Muromachi Period (1175-1573)). The lost main deity was miraculously found when the ninth head priest, Kotei-in Nikkyo, disturbed by the severely dilapidated condition of the main prayer hall, decided to renovate. Coincidentally, this main deity was discovered in the attic of the main hall on a Koshin Day in the spring of the eighth year of the An-ei Period（1779）. A brief account by Rev. 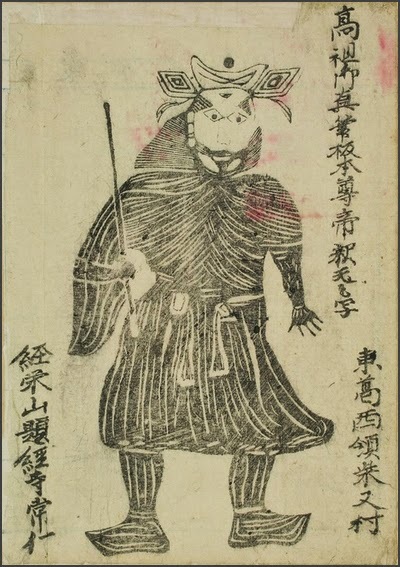 Nikkyo himself claims, "The main figure that was discovered in the attic measured two shaku and five sun in length, one shaku and five sun in width, and five fun in thickness. Contrary to its dimensions, it is very heavy and very hard owing to the heavy layer of accumulated soot. We were not able to make out what it beheld until we purified it with water. Whereupon, we found that one side was a wooden print block of the odaimoku carved by St. Nichiren himself in hopes that it would serve to prevent disease. On the other side is a woodblock print of Taishakuten. This, in fact, was the talked about main figure of worship. "This sutra is the medicine for all the ill people in the world. Should there be one who is sick and he or she should listen to this sutra, then they will be instantly cured and be free from the fetters of aging and death." 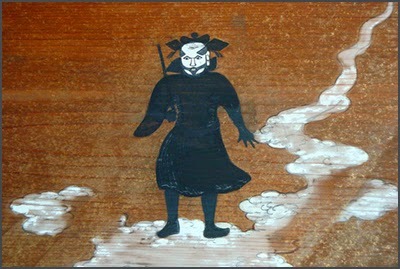 is carved the figure of Taishakuten in a pose of anger with the right hand wielding a sword and the left palm open. This figure depicts the conquering of evil. That is, those who believe and follow the Buddha's teaching will certainly be protected by Taishakuten whenever such a person becomes ill or is subsumed in fire or any other kind of disaster. Taishakuten will remove and destroy such evil. It was during the third year of the Tenmei Period(1781-1789) after the Anei Period(1772-1781) concluded in its ninth year that saw the spread of epidemics and starvation. Rev. Nikyo felt that it was time to save those who have experienced disasters. Thus, he carried the figure of Taishakuten by himself and visited the victims in various part of Edo and Shimofusa, among others. He passed out ichi-ryu go-fu, in which he staunchly believed, and encouraged the people to pray to the main figure which is said to have brought about many mysterious merits. In this manner, faith in Taishakuten initially centralized in Edo, expanded, especially when it began to be associated with the practice of Koshin-machi, fueling popularity in the temple's "Yoi-goshin" (Eve of Koshin Day) festival during the latter Edo period(1603-1867). "Among those associated with the Koshin faith, there is Taishakuten located in Shibamata of South Katsushika Ward. Taishakuten is a Brahmin God of India. though, it had little connection with the practice of "Koshin-machi", imported from China. Instead, the name "Koshin" in Daikyoji's case simply refers to the rediscovery on Koshin Day of its once-lost figure of worship. Ever since its discovery, Koshin Day has been celebrated by people from Tokyo to Ko-ume Hikifune, making pilgrimages in small groups, walking in the dark, through rice paddies and gardens, always greeting friends and strangers alike along the way, saying, 'Good morning, good morning'. This kind of scene reminds one of days past when everything was simple." For as far as one could see, lines of people with lit torches could be seem walking through towns such as Ko-ume, Hikifune, Yotsugi, and Tateishi, and then crossing the river at Magarikane (Takasago) and coming to Shibamata. And another row of shimmering torches passed through Senju and Niijuku, making the event quite a celebration. Tea houses that offer among other things, Kusa-dango (rice cakes of yomogi grass), still exist. People who make pilgrimages stay the night in the main hall of the temple, receive the day's first "o-kaicho" prayer in the morning, drink some holy water overflowing from the spring in the garden and then finally head for home. A day on which the 7th "stem" (kō) in the Chinese zodiacal system combines with the 9th "branch" (shin 'monkey') is known as kōshin, when believers spend an abstemious, all-night vigil for the sake of their longevity. The custom goes back to the Chinese Taoist Ge Hong (283-343), who in Baopuzi ("He Who Holds to Simplicity") claimed that there are three worms (J. sanshi) in the human body, upper, middle, and lower, which on the night of kōshin attempt to escape while their hosts are asleep and to report the sins of such mortals to the Celestial God , thereby causing their lives to be shortened. It is to prevent the escape of the worms that the vigil, called shukōshin, is held. The idea of sanshi appears to have come to Japan via Korea in the 8th century. In the 10th century, the custom was regularly observed in the Imperial Court, with the focus on the emperor, in the form of a banquet. Around the 11th and 12th centuries, perhaps under the influence of the Way of Yin-Yang (Onmyōdo) , the Laozi shou-gengshen qiu- zhangsheng-jing ("The Laozi Shou-gengshen (shukōshin) Quest for Longevity Sutra") was composed, and in the latter half of the 15th century a Buddhist account was added, entitled: Kōshin-engi ("Kōshin Origins"). In it, the objects of worship are said to include Shōmen Kongō (Skt. yaksa, renowned for warding off disease) , Kannon, and Amida. It is here that a Buddhistic kōshin cult originated; during the Edo Period, it spread to the general populace. Kōshin devotional groups continued to be formed, with kōshin halls and monuments being constructed in large numbers. Kōshin monuments were constructed on the occasion of a third consecutive annual kōshin vigil (kōshin-machi, see below), held together with memorial services. When constructed atop a hillock (tsuka) or in the form of a stūpa, they are called kōshin-zuka. 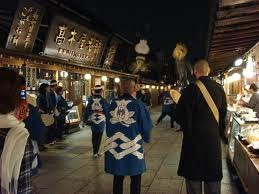 In the Edo Period, all-night vigils spread among the people; these came to be known as kōshin-machi. 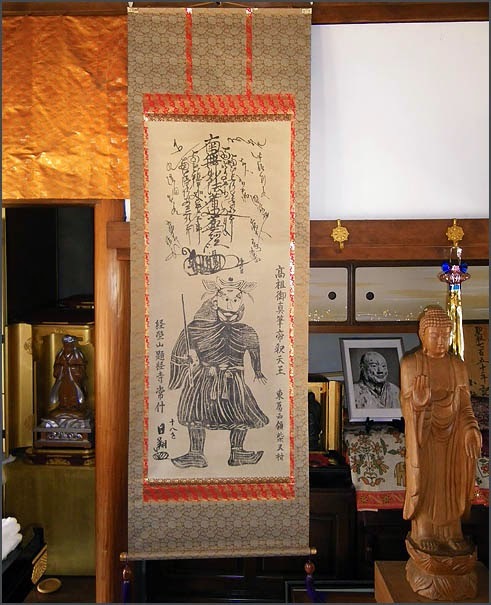 Kōshin pictures were hung, Shingon mantras or the Heart Sutra were chanted, and when these rituals had been observed, all-night conversations and feasting among the participants followed. Today, with the original significance of the vigil having been lost, the purpose of the custom has widely shifted to that of an ordinary banquet.
. san-shi no mushi 三尸の虫 Sanshi - The Three Worms. Mächtiger indischer Kriegsgott; lebt auf dem Weltenberg in dem Kikenjoo-Schloß, im Zentrum der neun Gebirge und der acht Meere (kuzan hakkai). Von dort aus registriert er die guten und bösen Taten aller Menschen. Shoomen Kongoo Ten war sein Bote. Im Kikenjoo-Schloß liegen vier Paradiesgärten (Taishaku Shien: Shuusha En, Zoorin En, Kirin En und Soaku En). Oft zusammen mit Bonten dargestellt, als Bewacher des Shakyamuni. Auch als Naturgottheit für Sonne und Regen zuständig. Gewänder mit langen Ärmeln über einer chinesischen Rüstung. Wenn mit Bonten zusammen, trägt Taishaku eine Rüstung und Bonten keine. Auf dem Helm des Taishaku befindet sich ein rhombenförmiges Muster. Im esoterischen Buddhismus auf einem weißen Elefanten mit drei Stoßzähnen reitend, ein Bein über den Rücken des Tieres hängend. Donnerkeil und Lotusblüte in der Hand. The museum was built next to the Tora-san Museum within Katsushika Ward's culture center in Shibamata, the hometown of the bumbling hero of the long-running series, also called Tora-san. The character was portrayed by the late Kiyoshi Atsumi. I believe the subject matter refers to Kōshin (庚申). I agree with Tomoë Steineck’s initial idea that the monkey relates to Kōshin (庚申), although she noted her concern that there are only two monkeys (rather than usual three). It seems, nevertheless, the number of monkeys varies. (Fabian would know about Kōshin probably better than anyone, at least better than me.) Kōshin, the calendrical combination of kanoe-saru that occurs every sixty days, refers to the cult (庚申講) of diverting the troubles of sanshi (三尸). According to the Chinese-Daoist tradition, the sanshi are the three parasites, which escape the sleeping human body to report the host's misdeeds and sins to the heaven every night of Kōshin. To evade the chance of sanshi’s departure people stayed up all night, which became the vigil known as Kōshin-machi (庚申待). Therefore, the moon on the lacquer tray represents the night. 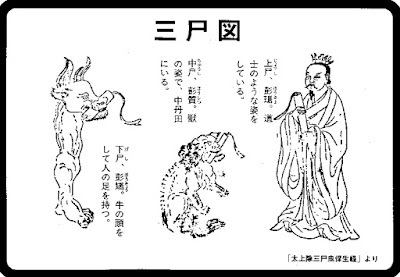 The appearance of the monkey alludes to Kōshin’s “shin,” the zodiac monkey, which makes a further link between Kōshin and the mythological deity, Sarutahiko (猿田彦 “Prince Monkey Field”), red-faced terrestrial kami who welcomed celestial kami first to the earth. The monkey with a gohei thus, I believe, stands for Sarutahiko. 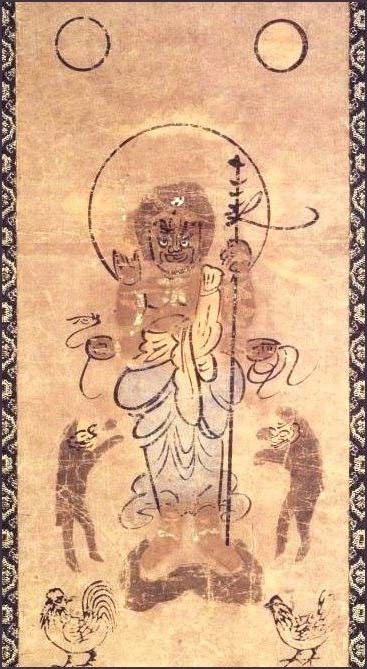 The other monkey may represent Sarutahiko’s mate, Ame-no Uzume, the deity of dawn whose comical dance let the Sun Goddess reveal herself out of hiding in the heavenly rock cave. Then, the moon may indicate a solar eclipse, in a mythological sense. This monkey sits on the pine tree, matsu, a homonymous pun on Kōshin-machi's machi (waiting). The gray bird, I believe it to be an uguisu (bush warbler), on a plum branch makes another reference to waiting, as they signify the seasonal symbols of anticipating Spring. Finally, the foreground may depict the island of Enoshima off the coast of Kamakura and Fujisawa cities. The Dragon palace-like structures seem to refer to Enoshima Shrine (consist of three shrines). According to their legend (Enoshima engi), Heavenly maiden (天女) pacified the troublemaking,ferocious Five-headed dragon (五頭龍). The maiden is the main deity of Enoshima Shrine, although she takes a form of a Buddhist icon, Benzai-ten after the amalgamating cults of the dragon princess and Banzai-ten. The main gate of Enoshima Shrine incidentally shapes after the typical dragon palace architecture. Enoshima is also famous for its rocky shoreline with caves, to which the craggy precipice on the lacquer tray seems to allude. One of the caves is dedicated to the Dragon King (龍神). According to the official website of Enoshima Shrine, in 1190 Hōjō Tokimasa visited the cave shrine and saw Benzai-ten (source: Taihei-ki). A couple of Kōshin monuments_ (庚申塔) (one of them depicts 36 monkeys!) on the island suggests active Kōshin cult on Enoshima. Without knowing its provenance, it is all conjecture, but might this tray be commissioned by a member (or members) of Enoshima Kōshin-kō (庚申講) to place offerings at the service of Kōshin-machi? If during the New Year rituals for Koshin Sama at a private home an earthquake happens, the rituals must be stopped and started again on another day. During an earthquake, Koshin sama will run out of the house and thus there is no point in making offerings to him. Day of the Monkey and the element metal. In the temple compound, with a stone inscription of the dates 1677 and 1690. Koshin memorials are rather seldom in Buddhist shrines. On the Shikoku Henro trail there is a 庚申堂 Koshin Hall at temple Nr. 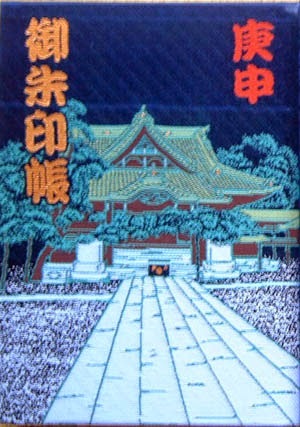 78 郷照寺 Kosho-Ji. Once a brave man was on his way to 伊勢神宮 Ise Shrine with a lot of money for offerings, but an Oni in the form of the 庚申 Koshin Deity took all his money away. But it was just a wicked person clad like Koshin. When the Deity heard the story, he hurried to give the money back to the brave man. Once during a typhoon, a ship was driven out to sea and eventually only one man of the crew, who believed in Koshin, was washed ashore at an unknown beach. He almost died of hunger but eventually was saved and came home to his family. Once upon a time, where was a couple living happily together. On お庚申さんの日 the day of the Koshin Festival, the woman blackened her teeth and on the next day went into the mountain forest, but did not come back. A few days later a villager said he had seen her. She had eaten fukutsu no kai ふくつの貝 shells of fortitude to be able not to get older. She would drink red blood and eat raw flesh every day. One day she came to see her husband and told him he would join her fate too, if he would blacken his teeth on the day of the Koshin Festival.